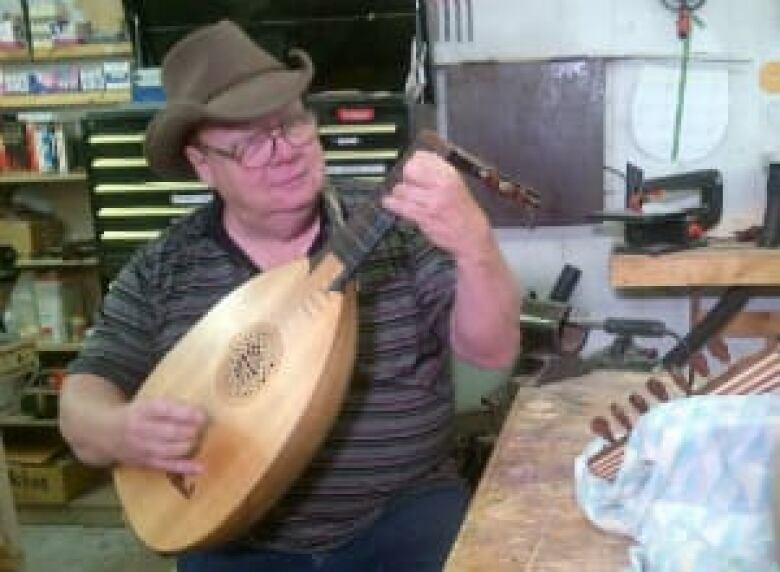 Saskatoon's Weldon Gray has entertained kids across North America and makes forgotten instruments for people around the world. It's a hot summer day at Pike Lake Provincial Park. A big fellow in striped short pants and a huge peaked cap holds a gaggle of youngsters in thrall. They shriek in delight at his on-stage antics, as one magic trick flops, while the next succeeds brilliantly. Even the adults are laughing at this pratfall-and-prowess schtick. This is the Wacky Wizard, aka Weldon Gray. "The Wacky Wizard is a big, giant six-year-old, who inherited his magic trunk from his uncle," Gray explained. "Hasn't got a clue how anything works but he's happy to go through it. And while everything backfires, everybody gets to watch and laugh." Gray keeps the action moving along with prompts from a giant story book, a device that replaced his former assistant who once failed to show up for a performance. 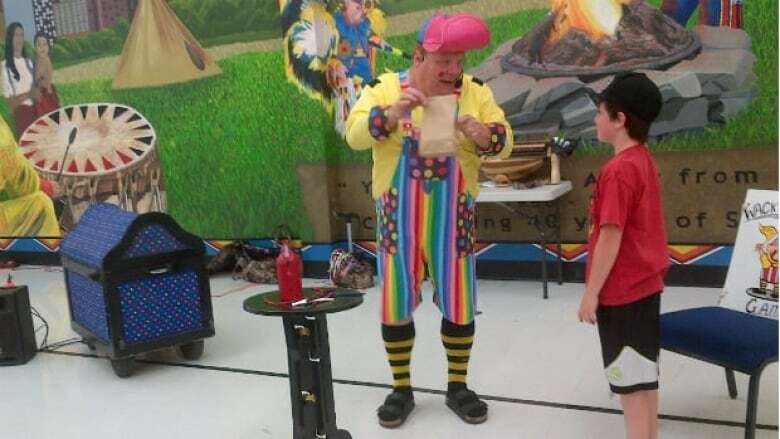 The Wacky Wizard has been performing in and around Saskatoon for the past decade, although Gray has been entertaining children most of his life. It all started as a kid growing up in Arizona. "When I was in the fifth grade, my mom bought me a ventriloquist doll and stood me up in front of the church, and so that's where I started doing that," he recounted. As a grown-up he went on to create his own kids' show with muppet-like puppets he made himself -- partly driven by his interest in sculpture. So he took his show on the road. He made a living travelling through the U.S. and Canada, sleeping in a trailer at night. The Wacky Wizard was a later invention. Gray has now been doing that show for about 20 years in all. He loves the attention and the routine never gets old. "I get a new audience every three years as they grow up," he said. "I'm always inventing new things to do." Invention is how Gray got to Saskatoon, in a round-about sort of way. His love of sculpting landed him work in British Columbia, where he made Flintstone cartoon figures for a theme park. There, he met and married a Canadian. When his wife retired, she let him pick where they would live. He remembered a place he passed through while touring his kids' show, called Saskatoon. "I really loved this town," he said. "When it came time to find a place to live, I wanted to live here." A chance to live mortgage-free, given the difference in B.C and Saskatchewan real estate prices at that time, was an added incentive. "That makes a big difference in your creativity when you don't have to worry about money," he said. These days, if you don't recognize Gray in his Wacky Wizard get-up, he might look more familiar in his medieval garb. He is also a member of the Society for Creative Anachronism, a group that re-enacts customs from the Middle Ages. This interest has spurred Gray onto another passion, lute-making. It started when Gray went to buy a lute, a guitar-like medieval stringed instrument, and couldn't find one. So he made his own. "The research was so much fun I just kept going," he said. "And now I guess it's an obsession. They're all over the house, kind of like rabbits just springing up everywhere." Gray converted his garage to a year-round workshop. He is self-taught, carefully researching designs, and learning by trial and error. He has branched into making other nearly-forgotten instruments, such as the hurdy gurdy, invented in the Basque area of Spain and France about 1,000 years ago. Anyone today who recognizes the instrument's name probably heard of it in a song by the 60's folksinger Donovan called Hurdy Gurdy Man. As word spreads of his handiwork, potential clients call from as far away as the Netherlands. His work earns him some grateful customers. One man who came to pick up his newly made instrument spent two hours playing it in Gray's living room. "I couldn't believe it," Gray said. "Like there's no way I could play that. But this guy, he's like a savant or something. And then he brought his partner with him and they're taking pictures. It's like they got a new baby and they're bringing it home. It was kind of a special moment. " Several samples of Gray's handiwork are currently on display at the University of Saskatchewan's Museum of Antiquities. The show, called Euphonia, runs to the end of September.